(a) Calculate the magnitudes of the force of buoyancy and the force of gravity acting on the empty vessel and state their directions. (b) Calculate the height x of the portion of the empty vessel that is submerged in kerosene. (c) Water is slowly poured into the vessel so that an additional 0.2 m of the height of the vessel is submerged in kerosene. Calculate the volume of water added to obtain this condition. 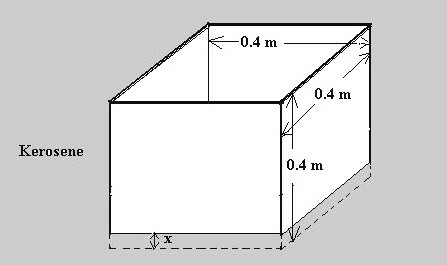 (a) The force of buoyancy acts vertically upwards while the force of gravity (which is the weight of the vessel) acts vertically downwards. They have the same magnitude since the vessel is in equilibriumn. Since the mass (m) of the empty vessel is 6.4 kg, its weight (mg) is 6.4×10 = 64 newton. Therefore the force of buoyancy and the force of gravitaty have the same magnitude of 64 N.
Axρg = mg where A is the area of the base of the vessel, x is the height of the portion of the empty vessel that is submerged in kerosene, ρ is the density of kerosene and g is the gravitational acceleration. 0.2 Aρg = Vdg where V is the volume of water added.and d is the density of water. 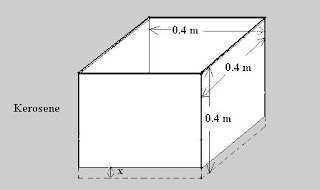 [Suppose you were asked to determine the pressure exerted by water at the bottom of the vessel when the condition mentioned in part (c) in the above question is attained. You will then divide the weight of the water by the area of the bottom of the vessel, remembering that the thrust at the bottom is produced by the weight of the water column in the vessel and pressure is thrust per unit area. (This is the same as Vdg/A)]. Now, go over here to find some more refreshing questions in this section.